Beazer Homes has recently begun a buildout of 126 lots in the master-planned community of Estrella located in Goodyear, Arizona. 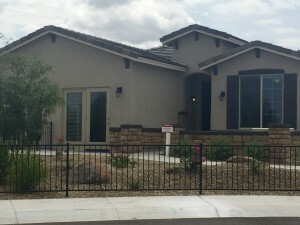 Beazer is one of six builders currently active in Estrella. 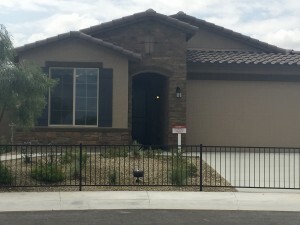 The community of Beazer Homes – Overlook at Estrella showcases four available floor plans ranging from 1610 – 2659 sq. ft., and base price currently starts at $220,900 up to $272,900. Kortright Group is a local Estrella-based real estate team committed to new home buyer representation. We are extremely knowledgable of this Beazer community and how it compares to Estrella’s other builders’ quality, options, efficiency and pricing in addition to understanding it’s place amongst custom lots and resale listings. The Silverado floor plan is featured as a model in the community. It is a one story with a great room, 2 bedrooms, 2 baths, 2 car garage and a flex option of either a study or a third bedroom. Square footage is 1,719 and base price starts at $223,900 and reaches $229,900 depending on the front elevation you choose. reat room and 3 bedrooms, 2 baths, a dining room, 2 car garage with storage and an optional bedroom 4 or study. Starting at a $232,900 base and reaching up to $237,900 again depending on the elevation. Kortright Group of West USA Realty offers up to a $1000 buyer credit at close and a free pre-drywall inspection amongst many additional benefits.